How do I send an Announcement List? 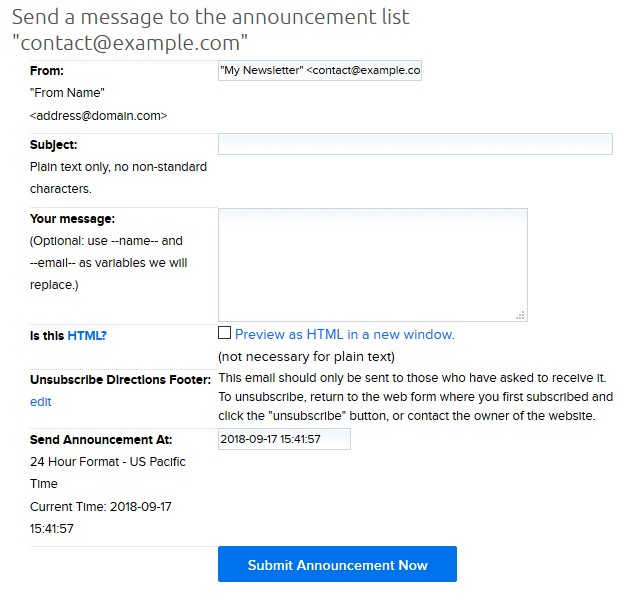 This article describes how to send an Announcement List within your DreamHost panel. Navigate to the Announcement Lists page. To the right of your list, click the Mail button. From: Enter the details that appear on the message’s ‘From’ information. The email address sending the message cannot be changed, but you can change the ‘From’ name if needed. Subject: Enter the subject line of the post you’re sending. This field only accepts plain text. Your message: Enter the body of the message here. This field will accept other non-standard characters, unlike the ‘Subject’ field above. Is this HTML? If you’re entering HTML in the 'Your message' field, you must check the checkbox next to ‘Preview as HTML in a new window’. To preview the message before sending it, click the link titled 'Preview as HTML in a new window'. Unsubscribe Directions Footer: This is the message automatically included at the bottom of all of your posts to allow users to unsubscribe from the list if they so choose. The message to the right of this field is the unsubscribe message you currently have set for your list posts. If you wish to edit that message, click the small ‘edit’ button under ‘Unsubscribe Directions Footer:’. Send Announcement At: Enter the date and time for when you want to send the post to the subscribed users. The field uses a 24-hour clock instead of the 12-hour clock and is set to Pacific Time (US). Once you have configured your message, click the Submit Announcement Now button to send your announcement list. Can I send HTML-encoded messages to my list? Yes. Check the box titled 'Is this HTML' which enables HTML tags in your message to be interpreted as HTML for people whose mail clients have HTML capabilities. You should paste your HTML code directly into the text area that says "Your message:". Also, even if some people on your list can't read HTML-formatted email, your message is sent as a multi-part message: those users with email clients that can't read HTML will still receive a plain text version. <html> tags should not be included in the 'Your message' field. If they are added, any HTML code in the footer does not render. How do the members post to the list? They cannot. This is an announcement-only mailing list, not a discussion list. If you need to create a discussion list, visit the article in the following section. What is an Announcement mailing list? How do I configure and manage an Announcement List? How do I add users to an Announcement List? How do I import/export a subscriber list to an Announcement List? How do I create a Discussion List? How do I import or export a subscriber list to an Announcement List?